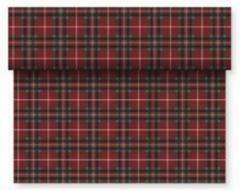 This red and green tartan table runner from Duni measures 4.8 metres long x 40 cm wide. It has perforations and so can be split into smaller lengths easily, can be used as table mats or of course a mix of the two. Great quality product for the price.